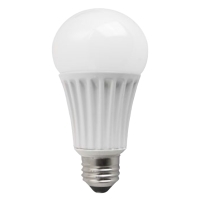 This dimmable LED bulb from TCP Lighting is energy efficient, consuming only 13 watts of power, yet delivers light that is the equivalent of a 75 watt incandescent. It has a light output of 1150 lumens and color temperature of 4100K for a cool white glow. This bulb is omni-directional, shatter-resistant, and has a long average lifetime rating of 25,000 hours. It is UL approved for damp location use and enclosed fixtures. This high efficiency LED provides illumination in all directions to provide exceptional lighting in a variety of settings.